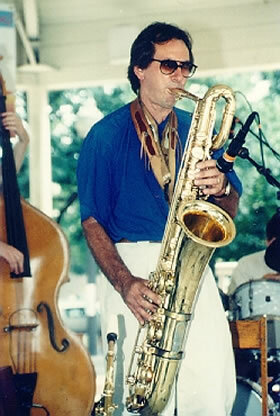 Bruce Johnstone, one of the country’s premier baritone saxophonists, longtime JazzErie member and supporter, and SUNY Fredonia music faculty member, will be performing and conducting a workshop during two days in April in nearby Fredonia and Jamestown..
• “The Carousel Strings,” a ten-piece string section plus rhythm section, featuring Bruce Johnstone. Admission for the concert is $3 for students; $5 for general admission. These programs will be preceded by an open clinic for music educators and interested parties conducted by Bruce Johnstone. The Clinic will begin at 5:30 p.m. Contact Mike Kelly at Jamestown Community College, 716/338-1157, for directions and more information about these programs. On Wednesday, April 25 at 8:00 p.m., the Wednesday Night Big Bands and the Carousel Strings will perform with Bruce Johnstone. The concert is at Diers Recital Hall. Any or all of these will be a great chance to get your Spring, 2012 Bruce Johnstone fix! Fredonia is a beautiful town and SUNY Fredonia is an easy campus to navigate. 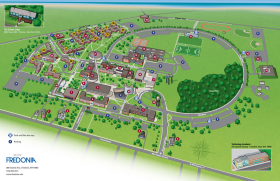 The university provides a campus map and an interactive map. Editor's Note: We originally reported a concert to be held on Monday, April 16 at 8:00 p.m.at Rosch Recital Hall on the SUNY Fredonia campus. That information was incorrect.